Lakhdar's transformations--from a boy into a man, from a devout Muslim into a sinner--take place against some of the most important events of the past few years: the violence and exciting eruption of the Arab Spring and the devastating collapse of Europe's economy. If all of that isn't enough, Lakhdar reunites with a childhood friend--one who is planning an assassination, a murder Lakhdar opposes. 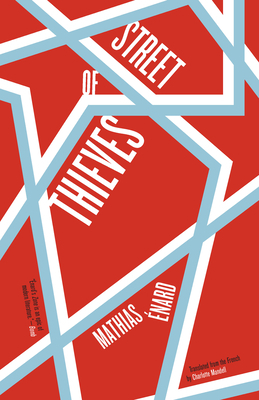 A finalist for the prestigious Prix Goncourt, Street of Thieves solidifies nard's place as one of France's most ambitious and keyed-in contemporary novelists. This book may even suprpass nard's earlier work, Zone, which Christophe Claro boldly declared to be "the novel of the decade, if not of the century." Mathias nard studied Persian and Arabic and spent long periods in the Middle East. A professor of Arabic at the University of Barcelona, he won the Prix des Cinq Continents de la Francophonie and the Prix Edm e de la Rochefoucauld for his first novel, La perfection du tir. He has been awarded many prizes for Zone, including the Prix du Livre Inter and the Prix D cembre. Charlotte Mandell has translated works from a number of important French authors, including Proust, Flaubert, Genet, Maupassant, and Blanchot, among others. She received a Literary Translation Fellowship from the National Endowment for the Arts for her translation of nard's Zone along with a French Voices grant.